“You are,” Papa Dave said. ©2011 George Ella Lyon. All rights reserved. 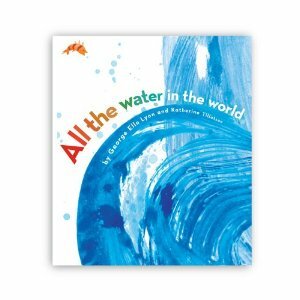 Since last we saw George Ella Lyon around these parts (with her fab Trying to Get Out of My Tree), her The Pirate of Kindergarten won the ALA's Schneider Family Book Award and her new picture book, All the Water in the World has come out to rave reviews. I'm sure lots of other stuff has happened, too, but I'm just here to report a few highlights! I also have to add that I love No Need for Metaphor. I love its directness... and it's slyness. You get character, you get story, and you get laughs from the combination, all in nine brief lines. Yup, love it I do, and that's just one of the reasons I'm so happy to have George Ella Lyon here as part of 30 Poets/30 Days. Yesterday gave us I Am Huffing, I Am Puffing by Graham Denton. Tomorrow... Avis Harley gives us a handful (clump? cluster?) of Clerihews. For more information on 30 Poets/30 Days and how to follow along, please click here. Brilliant! I love everything I've read by George Ella Lyon. Will look out for the ones you've mentioned here, thanks! Sly is a great word for that ending! Ever since your book, Father Time and the Day Boxes, you've had me, Ella!